Fibromyalgia and Chronic Fatigue Syndrome (CFS) are 2 disorders for which there are lots of unknowns – including major areas such as causes and treatments. Reviving the Broken Marionette provides a great deal of solid information about medication treatment for these conditions. 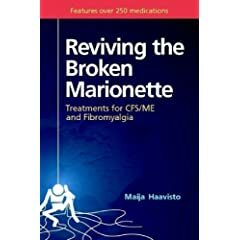 The author, Maija Haavisto, is a Finnish medical writer who developed an illness in 2000 that was finally diagnosed as CFS in 2002. Because of lack of information about these disorders in her own country, Maija hunted for information and developed an expertise that she used to help herself. And thankfully she was able and willing to compile what she learned about medication treatments into a book to share with others. There are several strengths to the book, the first being that the medication information appears solid and well-researched. Second, it includes some less-used medications (e.g. antibiotics for CFS), which can educate patients about medication options that even their physicians might not be aware of. Third, there is a chapter that covers experimental therapies. The glossary and index are useful. What could add to the helpfulness of the book is some guidance about putting this knowledge to work. The book is basically a thorough discussion of different medication classes – and what the book does, it does very well. However, it might review in what order to try the medications, or what combinations are particularly useful. As well, patient examples would bring the material to life, perhaps with stories presenting real patients’ symptoms, and what worked or didn’t work. I am not cured by any means, but I got my life back, my brain back, and my illness seems to have halted its progressive course. If there is a moral to this story, it is about hope. Never give up hope. Medicine can do amazing things. We are broken, but not beyond repair. Thank you, Maija, for sharing that message!